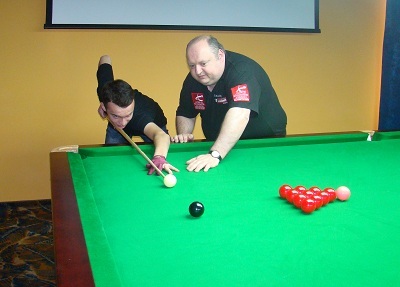 The European Billiards & Snooker Association are holding EBSA Coaching Zone with EBSA head Coach PJ Nolan and Corné Kuijpers each morning this week from 8.45am-9.30am during the 2014 EBSA U-21 Snooker Championships to highlight the EBSA Coaching Academy. The team of EBSA Coaches will conduct free sessions for the players to learn the skills of the game and this morning on day four it involved players from Bulgaria when Georgi Velichkov, Ivailo Pekov, Sashko Dimitrov, Spasian Spasov, Stefan Simeonovski and Teodor Chomovski had training in the Caro Hotel in Romania. This morning the PJ and Corné worked with the Bulgarian players on how to prepare a warm up exercise before their match and how to improve their Break Building and Long Potting. At present EBSA have 25 Qualified coaches from all across Europe from Ireland, France, Romania, Israel, Bulgaria, Wales, Malta, Germany, Poland, Netherlands, Portugal and Spain on the coaching team.